The 51-year-old, son of former FAI treasurer Joe Delaney, chose his moment to reach a position of power within the Association when it desperately needed reform. He joined the board of directors of Waterford United in 1996, having been a boyhood supporter of the club, going on to represent the Blues on the FAI Senior Council. In 2001, he become the youngest ever treasurer of the association at the age of 33. Within a year of Delaney having a position on the FAI board, Irish football was rocked to its core as events in Saipan put public scrutiny of the body at an all-time high. Delaney called for a new regime, and when Fran Rooney resigned in 2004, he became interim and then permanent CEO. At the time, it was said his credentials for the job were enhanced by his involvement in securing a multi-million euro sponsorship deal with Umbro, and similar deals were always a fillip for Delaney’s rule. Within 18 months his contract was extended by five years. After failing to qualify for the World Cup in 2006, Brian Kerr parted company with the FAI, as Delaney oversaw his first managerial change. He told RTÉ at the time: "The view was that performances and results were not what we hoped for. "Our FIFA ranking dropped and our co-efficient in terms of European qualification dropped from two to four - they were key issues. "We took the emotion out of the issue and made a business decision effectively." The FAI also took over the running of the League of Ireland as a mood of optimism swelled around that facet of Irish football. Delaney then made an appointment that he hoped would show his knowledge of the game. A host of high-profile names had previously been linked with the vacancy, notably Martin O'Neill, Alex Ferguson and Terry Venables, but Steve Staunton emerged with a four-year contract as Ireland boss and the veteran Bobby Robson as 'international football consultant'. Staunton's tenure ended in disaster and there was pressure on the CEO to get it right next time. Eamon Dunphy, working as an RTÉ Soccer analyst at the time of the draw with Cyprus that preceded Staunton’s departure, said: "As things stand tonight, John Delaney’s credibility is shot to bits. Responsibility has to be accepted and a decision has to be made." Dunphy was rarely as a critical of the FAI chief executive ever again. Businessman Denis O’Brien got in touch offering to partially fund a top-class appointment and Italian Giovanni Trapattoni agreed to take the job. The appointment was met with delight and came at critical time for Delaney with sponsorship deals either up for renewal or based on future success. As recession hit, it impacted the FAI finances badly. The FAI had gone to the market in 2008 with ten-year premium tickets priced between €12,000 and €32,000 for the new Aviva Stadium. It proved a foolish move. The plan was eventually abandoned and the Association's debt relating to the stadium remained significant after it opened in 2010. Failure to qualify for the next World Cup was a further blow. Thierry Henry’s handball in the play-off defeat to France led to worldwide coverage, and an infamous request to be the 33rd team at the tournament that drew laughter from some quarters and red faces. Dublin hosted the Europa League final in 2011 as Delaney ticked boxes that pleased some but, as each year went by, unhappiness in the League of Ireland rose. Free train transport between Bratislava and Zilina after a travel mix-up, plus free beer, made Delaney a hero among selected members of the Irish away support, but there were still difficulties to overcome. FAI accounts for 2012 showed it owed €59m on the Aviva Stadium and it was the League of Ireland, staff and the game in general that suffered. Prize money was slashed, employees suffered pay cuts and clubs went to the wall. Delaney's much discussed €400,000 wage was reduced by 10% but that did little to appease those that saw it as a hindrance to the game here and unnecessary. Qualification for Euro 2012 raised spirits, and Delaney continued his tradition of throwing his tie into the away section, the celebration in Tallinn a sign of things to come. Drunken scenes, lost shoes, three heavy defeats and the end of Trapattoni brought new challenges, including talk of some regret at his behaviour, but a love of being amongst the fans. The FAI secured a debt write-down of €11.7 million in 2014 and extended his contract to 2020. 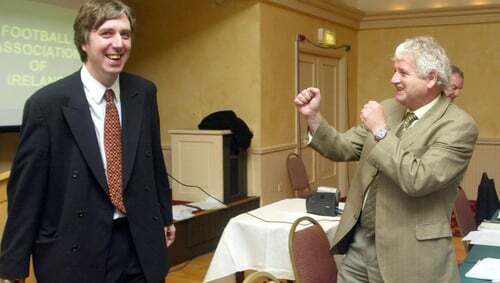 The next controversy came with a video of Delaney singing a Republican ballad, which was initially denied by the FAI, with that put down to "a misunderstanding". By now, Delaney had taken a firm grip of power among the grassroots, who praised his industry and support, with government grants and Aviva Stadium tickets at the heart of that, but a growing unease was strong in other areas. "The League of Ireland is a difficult child for the organisation," became words to use against Delaney, on denying the domestic game was on its knees in 2014, and citing future development work, much of which is still in its infancy to this day. Martin O’Neill and Roy Keane arrived to fanfare prior to that and a 3-0 win over Latvia meant all was right in the game again. Ireland also secured hosting city rights at Euro 2020, with the chief executive paying tribute to the work of Declan Conroy, who helped put together the bid. Delaney’s profile continued to rise, with a documentary made by the Irish Independent to tell his life story. Appearances in Life Magazine and RTÉ's The Saturday Night Show to discuss more than football brought more fame. However, after press events with the football media offered little positives, access to journalists in showbiz rather than sport became a regular theme, as hard-hitting questions became easier to avoid. Again controversy would follow. It transpired that FIFA had paid €5 million to the FAI following the Thierry Henry handball. An interview with Ray Darcy led to the disclosure of what Delaney described as a "contentious matter". "It’s a very good agreement for the FAI and a very legitimate agreement for the FAI. I’m bound by confidentiality for naming the figure," Delaney told Ray D'Arcy. "You’ve put a figure out there [€5 million] and fair play to you. It was a payment to the association not to proceed with a legal case. And in there they signed a confidentiality agreement where I can’t talk about the amount involved." "You used a figure there, well done to you, but it was a very good and legitimate deal for the FAI." But while the lead employee of the organisation courted the spotlight, it was the delegates and junior clubs that brought him his greatest support. He told the FAI AGM in Sligo in 2015 that "I do not take your support for granted and never will." Noel Kennedy, representing Sligo/Leitrim, said: "You're the best chief executive officer, John, that we've ever had." The same delegate once added that "the word legend is a little overused in today's media but when one considers what a young man from Waterford who played his football with his beloved St Michaels of Tipperary has done for the Football Association of Ireland and its players at every level, he is, I'm sure you will agree, a true legend." This was typical of the grassroots support Delaney possessed. Beating Italy to reach the last 16 of the European Championships in 2016 was the high point of the O'Neill era and Delaney was out of the spotlight in this tournament. But just two months later, in August, a Brazilian judge authorised the country’s police to seize Delaney's passport as part of the investigation into alleged ticket touting at the Olympic Games. Delaney, who was also a vice-president of the Olympic Council of Ireland, issued a statement saying "The Brazilian police have never contacted me in relation to any aspect of OCI business and a Brazilian Judge has withdrawn a warrant previously issued for my passport. "I had absolutely no role or involvement in the OCI's handling of ticketing arrangements for the Rio Olympic Games and no knowledge or awareness of PRO 10 or its position as the OCI’s Ticket Reseller." Delaney was successful in the UEFA Executive Committee election in 2017, gaining 48 votes to finish second behind Karl-Erik Nilsson of Sweden in the poll of national federation representatives in Helsinki. His total vote was ahead of some of the most influential figure in Europe including former Manchester United chief executive David Gill. Last month Delaney said his UEFA remuneration for 2018, thought to be a six-figure sum, was donated back to the FAI on a voluntary basis, but that information only emerged on the back of the news of the €100,000 bridging loan. Martin O’Neill’s departure last November brought Irish football under more scrutiny and the dual announcement of Mick McCarthy and Stephen Kenny was one more move by Delaney to keep on ticking on. Protests had taken place in Aarhus in the final game of the O’Neill tenure, and when The Sunday Times uncovered the €100,000 loan story – and the €36,000 annual rent supplement – that continued into the first matches for McCarthy. He resigned as chief executive on the night of the Gibraltar game, moving into the newly-created role of Executive Vice-President. Some fans threw tennis balls onto the pitch in the 33rd minute of the Georgia game. This week finally saw the end game for an undoubtedly divisive figure. His refusal to answer any questions on his tenure as chief executive and offer more details on the €100,000 bridging loan "on legal advice" angered the Irish public. Fury continued at League of Ireland games - places he suffered most criticism - and Delaney’s time was finally up. On Sunday, expenses reported in The Sunday Times brought even more questions of the nature of spending within the FAI with Delaney in a position of supreme power. On Monday evening, it was confirmed b the FAI that Delaney had "offered to voluntarily step aside" from his role as Executive Vice President "pending the completion of an independent investigation by the Association into issues of concern to the Board". In a statement, the organisation said: "The Board acknowledges all concerns raised by stakeholders and supporters and is working to ensure that all government funding is restored to Irish football at the earliest opportunity." More probing of the body is likely now, and the findings will define the legacy of John Delaney, a man who prided himself on being head of the Irish "football family" and modernising the Association, but steps aside looking like the type of leader it didn't need.